There’s a particular love that beverages can inspire in people– I’m sure winos, beer aficionados, and Diet Coke heads can feel me on this one– it’s part deep appreciation, part comfort, and a huge part ritual. It’s the snap of the can tab breaking, or watching the head lace on the side of the glass, or swishing it around to get a whiff of the bouquet. It’s pretty safe to say, however, that hardly anybody loves one beverage more than the way people who love coffee, well, love coffee. Nobody knows coffee love better than the founder of this week’s small business spotlight, French Truck Coffee. Geoffrey Meeker was inspired by a bag of coffee beans bought for him in San Francisco that had been roasted only two days before he ground and drank them. It was a revelation and it began his quest to bring fresh, small batches of hand-roasted coffee to the people of New Orleans. Residents and visitors can order a cup of coffee and it’s delivered promptly in a French truck from the Bordeaux. I roast coffee like it used to be done. Around the corner, in small batches with the time and care not afforded by the big factory coffee companies. Coffee is like bread; fresh tastes best. Changing people’s perception that coffee is something you keep in the pantry and use until it’s gone. If you bake an amazing cake and then put it on the shelf for two weeks before you eat it, it’s not so amazing after that. Coffee is the same. Probably learning the how to get the best value from all of my vendors without beating them up too much. It’s just as important to be a good customer in a B2B relationship as it is vendor. When my coffee roaster arrived I recruited 3 guys from the neighborhood to help move it into place. The manufacturer told me it weighed between 300-400pounds. It ended up being 750 pounds. Those three guys STILL get cheap coffee from me! Plan, plan, plan and then make sure you have enough money set aside for when the plan doesn’t work. I am pretty happy with how things are going so far. I think the only change I would make would be some of the negotiations. I tend to be too nice. FRESHLY roasted coffee is always the goal and a small group of shops roasting their own coffee is the plan. 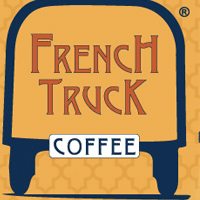 French Truck Coffee’s call for a new logo received 242 entries.